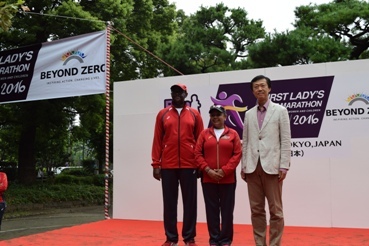 On August 30, 2015, three JICE staff members joined the 5 kilometer jog around the Imperial Palace led by Her Excellency Margaret Kenyatta, the First lady of the Republic of Kenya together with many Kenyan students and business persons, the staff from JICA and health-related NGOs. 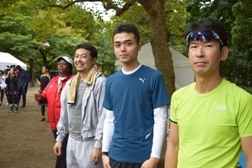 Following this symbolic jogging event, the First Lady’s Half Marathon (FLHM) 2016 was launched at near-by Hibiya Park with the attendance of the First Lady, His Excellency Mr. Solomon K. Maina, Kenya’s Ambassador to Japan, Mr. Norio Maruyama, Director General of the Ministry of Foreign Affair’s Africa Bureau, Ms. Keiko Sano, to-be-appointed Chief Representative of JICA in Kenya, and many other supporters. 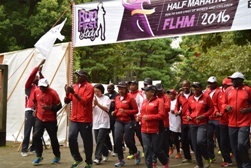 FLHM is a well-known annual event in Kenya to raise awareness about child mortality and maternal health which is still a serious problem in Kenya and many countries in Africa. It is also intended to mobilize support to the First Lady’s “Beyond Zero Campaign” to raise fund to build maternity care clinics across the country. Along with FLHM, the Tokyo International Conference for African Development (TICAD) will be hosted by Kenya in 2016. Kenya’s First Lady Margaret Kenyatta ran a “marathon” around the Imperial Palace on August 30 to appeal support for her campaign for zero child mortality. 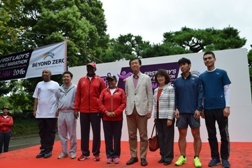 Mrs. Kenyatta, who had visited Japan to participate in the “World Assembly for Women” until August 29, started to run from Hibiya Park and jogged for five kilometers around the Imperial Place together with fifty-some Kenyan student and Japanese citizen runners. 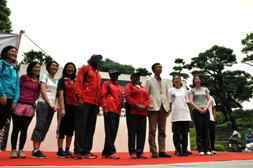 After finishing the run, the First Lady greeted her co-runners and supporters by stating that we must keep mothers and children from preventable death while thanking the Japanese Government’s support for her campaign. She also appealed support for the First Lady’s Half Marathon to be held in Nairobi in 2016.